I'm pleased to partner with my favorite accessories store ShopLately for their blogger week! I chose to collaborate with Lily Wang, an online boutique based in Los Angeles. Having purchased from Lily before I already had a lengthy list of favorite's going on. For my choices I kept it rock n roll with studs & spikes while working in lots of Gold for the Holiday's. Be sure to head over to my Sale Event GOING ON NOW where you can pick up mine and Kats Loves Fashion's picks from Lily Wang through 11/17! Get them fast before they sell out! Fake Diiieeeemonds with spikes are a girls best friend. 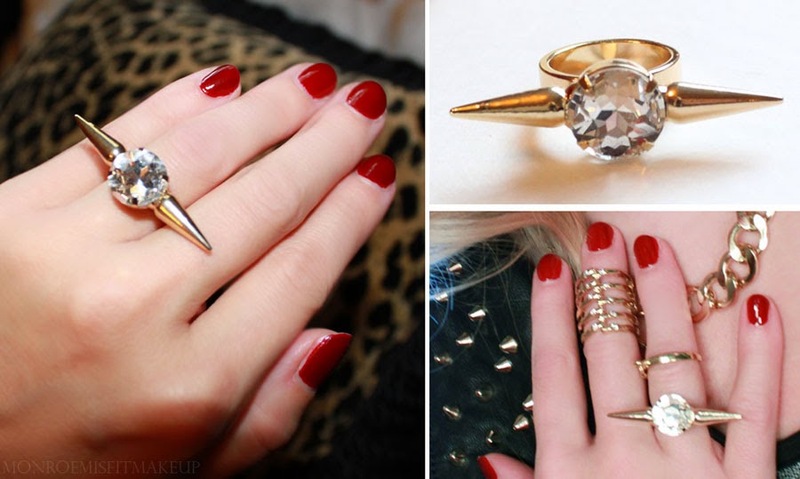 The sister to the black gem spike finger ring from my previous ShopLately Review. This ring is labeled as one size in a 5, but I'm more around a 6.5-7 in rings and it fits perfectly. The center gem is bright and sparkly and the spikes offset the size of it just right. 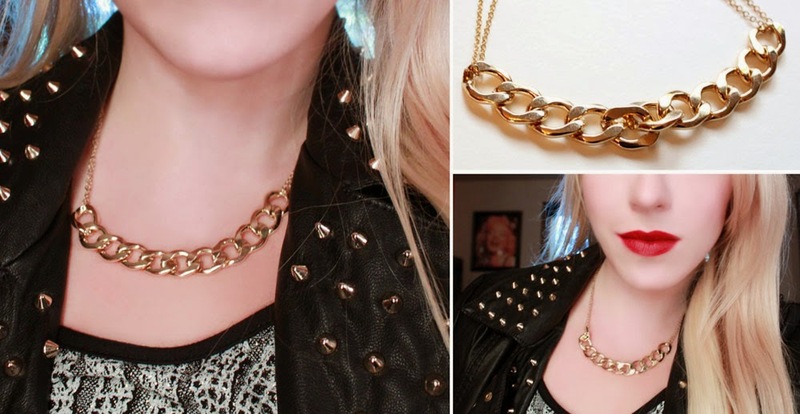 A staple every one needs in their jewelry collection, a basic chain necklace. This is the necklace you can put on with anything be it casual or posh and it just goes. The"gold" chain is excellent quality, the chain feels weighty and the links aren't too large. 20 1/2" in length, 2" extender made of metal brass and lead and nickel safe. 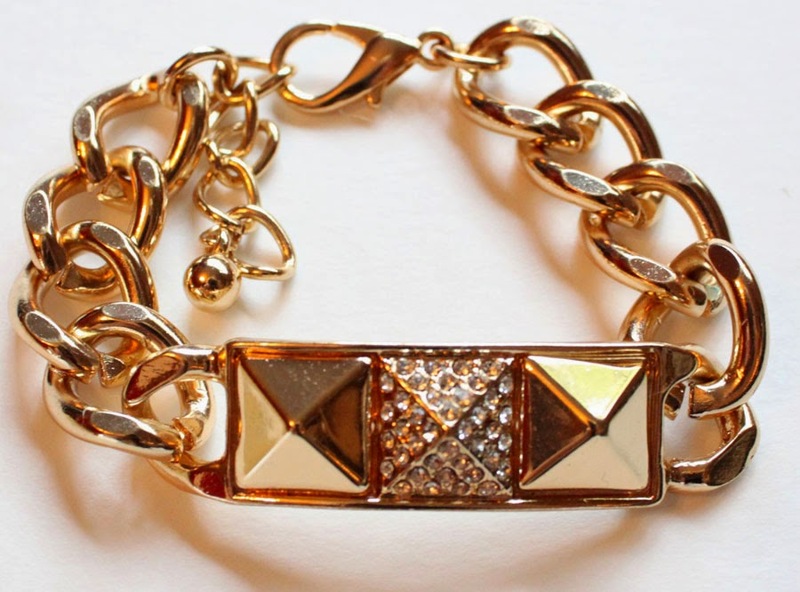 This bracelet is a flashy gold with a 7 1/2 inch chain link bracelet and three pyramid studs. The pave crystals mid-stud make it look much more expensive than its small price tag. I like pairing this bracelet up with Lily's gold chain link necklace. Dainty yet dangerous the Jaicee headband features pearl, crystal and spike details. It sets on a slim silver metal headband with open ends. The small spikes combined with the delicate pearls and crystals make it edgy meets classy. Your Holiday party hair needs this. 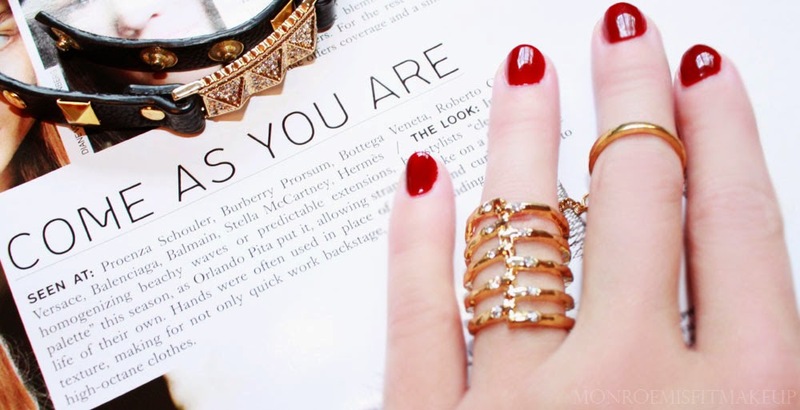 Lily Wang is just one of the many awesome shops you'll find on ShopLately. Not only do they offer amazing accessories, but now apparel and shoes too. Sale events happen on a daily basis with great prices and new arrivals coming in all the time. 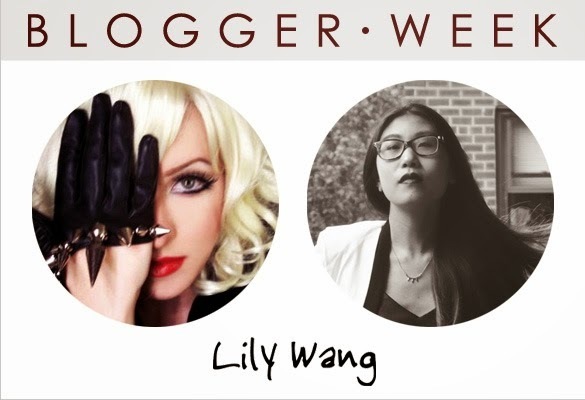 Check out my Lily Wang Event going on now! HERE (Tues Nov. 12th-17th.) for these and more pretty jewel's. Remember to Sign Up to get a $5 credit off your purchase and for a limited time $10 if you sign up through facebook.